Skiing and snowboarding are visual—the movements, the action, plus the smiles. 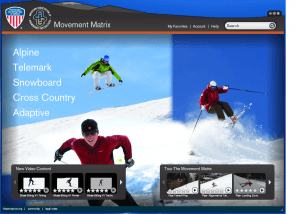 With more than 300 videos with voiceover, the Movement Matrix is a unique online resource that captures visual examples of skillful skiing and riding—covering alpine, cross country, snowboard, adaptive, and telemark disciplines. And, as an expanding resource, new videos are added on an ongoing basis. Covering the Skills Concept, situational skiing and snowboarding, and drills, the Movement Matrix is a one-stop shop for skiing and riding improvement and snowsports teaching endeavors, be they personal or professional. This dynamic tool is designed to provide something for everyone and is proving to be an indispensable supplement to other PSIA and AASI training. The Matrix is your one-stop shop for all ski and snowboard educational video content. Watch videos on all disciplines, including adaptive, alpine, cross country, telemark, and snowboard. Maximize your learning time by sorting the videos you want to watch by conditions, terrain, and level. Check out the free e-learning modules too. New content and video is being added often. You can even chime in with content ideas or upload your own video! The Matrix has information you won’t find anywhere else!